Yesterday was really one of those nose-to-the-computer-screen days. No morning journal, no mid-morning workout. In fact, I didn't leave the house (just as well since I hear it was blistering hot). I have too many unfinished projects. They taunt me. One is a set of 127 large mounted photographs, that were attributed by the seller to " Paul Wall." They date from about 1940 (previous reference). Ever since I let them out of the closet (with the promise to find them a good home), they've been stacked on the living room floor waiting for me to do something. Yesterday I scanned them all into the computer and made of list of their titles and dates. Whew. Wall is a mystery because I can't find any evidence of him on the internet -- a rarity for someone who seemed so accomplished. And Jim couldn't remember where or why he bought them. Wall won a couple prizes -- one for the photo on the right. I think it's a gem, but lot of his photos (upstate NY, Washington DC, Boston, etc) are fairly ordinary. Maybe he was only an enthusiastic amateur who took good care of his prints and was diligent about labeling them. I did have the presence of mind to write the archivist at the George Eastman House, who said he was from Chicago and showed me how to access an old database of theirs. Their database gives no personal information but lists exhibits he participated in. There are 14 of them, from 1936 to 1941, nearly all labeled "Salons of Photography." 1.1939 4th Rochester International Salon of Photography, Memorial Art Gallery [Rochester NY]. Entry: "Frozen River," chlorobromide print in monochrome category. 2.1941 4th Rochester International Salon of Photography, Memorial Art Gallery [Rochester NY]. Entry: "The Tired Team," bromide print in monochrome category. Museum holdings. Also according to the George Eastman House database, a "modest" number of Wall's images are held by both the University of New Mexico Art Museum and the Brooklyn Museum of Art. In effect, the term Pictorialism is used to describe photographs in which the actual scene depicted is of less importance than the artistic quality of the image. Pictorialists would be more concerned with the aesthetics and, sometimes, the emotional impact of the image, rather than what actually was in front of their camera. Not all of Wall's photos achieve high art, but at least now I know what he was going for. Two of the Salons were held here in Rochester at the Memorial Art Gallery. This afternoon Jim and I are going to visit their library to see if an old catalogue is available. Photo by Paul Wall, Chicago. 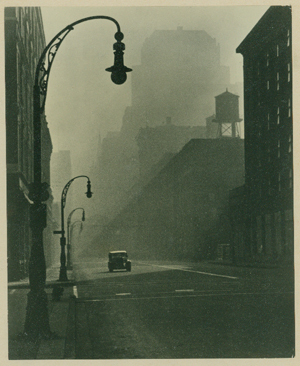 “Morning Downtown” 1st prize Popular Photography magazine, circa 1940.